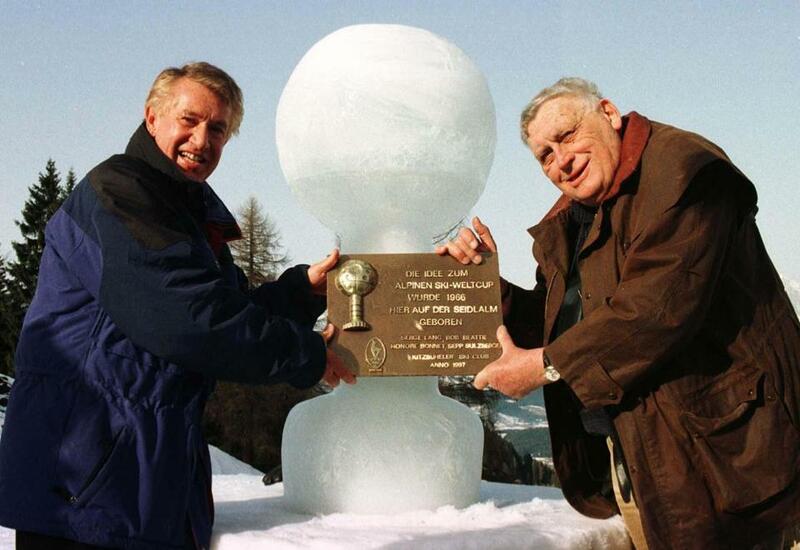 World Cup founders Serge Lang (right) and Bob Beattie in 1997 in Austria. Sign up to receive Globe sports news alerts by email. DENVER — The plaque that rested for years on ski icon Bob Beattie’s desk was inscribed with a matter-of-fact motto: It can be done. It was a fitting mantra for the ski racing pioneer who helped launch the World Cup circuit more than 50 years ago and was part of the commentary crew that called one of the most thrilling Alpine races at the 1976 Winter Games. Beattie died Sunday in Fruita, Colo., after dealing with various health issues. He was 85. He was born in Manchester, N.H. Known as ‘‘Beats’’ or ‘‘Coach’’ to his friends, Beattie’s career included stints as coach of the US ski team and at the University of Colorado, where he led the Buffaloes to a pair of national titles. In addition, Beattie was paired with Frank Gifford to call one of the Winter Olympics’ most famous ski races for ABC — Austrian great Franz Klammer’s electric downhill run to capture gold in ‘76. Soon after, he went to Boulder, Colo., to be an assistant football coach before taking over the ski program and turning it into a national power. The Buffaloes won the title in 1959 and again in ‘60. That gained him even more recognition and he oversaw the US ski team at the 1964 Olympic Games, where Billy Kidd and Jimmie Heuga finished 2-3 in the slalom. It marked the first two Alpine medals captured by the American men at the Winter Olympics. ■ ‘‘So grateful I had the chance to meet this innovator, icon, and legend! Rest in peace Bob Beattie,’’ Shiffrin posted . ■ ‘‘R.I.P. Bob ... such an amazing and charismatic man who did so much for ski racing. We will miss you!’’ Vonn wrote . Over his career, Beattie worked four Winter Games, along with calling volleyball at the ‘84 Summer Olympics in Los Angeles. He also was involved with ABC’s Wide World of Sports and hosted a ski show for ESPN. In 1984, he was inducted into the U.S. ski and snowboard hall of fame . ‘‘He influenced a lot of people,’’ his son said.